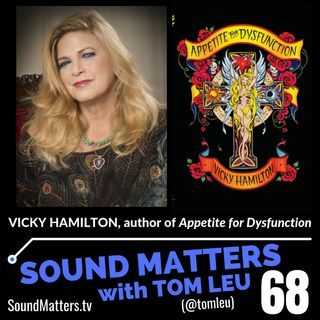 Sound Matters episode #068 features Tom's great conversation with music industry executive, Grammy winner, and author of the compelling memoir, Appetite for Dysfunction, Vicky Hamilton. Considered one of the most successful music executives in the industry, Vicky Hamilton has discovered, developed or managed the careers of Mötley Crüe, Stryper, Poison, Guns 'N' Roses, Faster Pussycat and many others (Lost Boys, Randy O). David Geffen hired her as A&R executive at Geffen ... Más informaciones Records. She has also worked with famed manager Elliot Roberts at Lookout Management/ Vapor Records, before moving to Capitol Records as A&R consultant. Vicky released country legend, June Carter Cash’s album Press On, on her Small Hairy Dog label in 1999 which went on to win a Grammy in 2000. Currently, Vicky owns and operates Aesthetic V management and productions, which represents and develops bands, artist and special projects. 09:55 - Possible TV series...?